The Justice LJ10H Series Open Hopper Progressive Cavity Pump represents an ideal pumping solution for viscous solutions with high solids contents such as filter press feeding in the industrial wastewater industry. Flow rates of 27.7 GPM/ per 100 Revolutions (85 GPM to 127 GPM) at 0-150 PSI are standard through the range of the series. The Justice Series offers a design of a heavy-duty auger mated to a rotor and stator for the most difficult pumping applications available today. 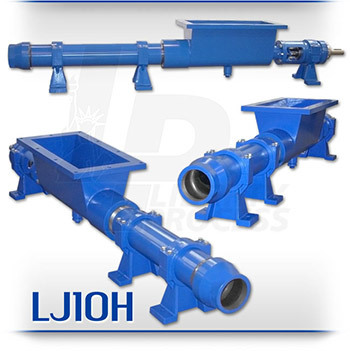 The modular design of the LJ10H Justice Series Open Hopper Progressive Cavity pump is a hardened pinned-joint drive assembly with a body available in steel or 316 stainless steel and internal wetted components in either stainless steel or hardened tool steel with hard chrome plating for long-life and durability in abrasive pumping applications. Rotors and Stators for the LJ10H Justice Series are available in 1, 2, and 3 stages for applications with 75, 150, and 225 PSI discharge pressures with stators available in Buna Nitrile, Viton, EPDM and Natural Rubber. The standard seal design is a set of packing with a lantern ring and flush connectors. Mechanical Seal options are readily available.